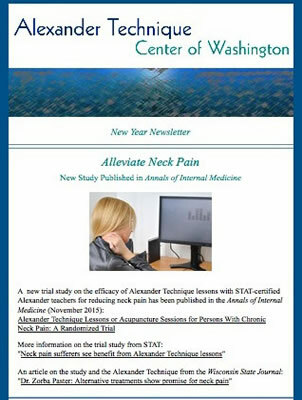 The Alexander Technique Center's Newsletter has interesting news, updates, and helpful information about learning and practicing the Alexander Technique. The newsletter also includes information on upcoming workshops, intensives, special events, and special lesson series. Holiday and Winter Intensives. Holiday Gift Certificates. My Ergonomic Chair. Special Winter Lesson Series. Aphorisms by F. M. Alexander. The Performing Self. Summer Intensives. F. M. Alexander's Books. Special Early Summer Lesson Series. Alexander Technique and Golf. Alexander Technique in the Theater Podcast. Pillot study showing efficacy of Alexander Technique lessons for osteoarthritis patients published in BMC Journal. Holiday and Winter Intensives. Alexander Technique for Singers at George Mason University. Winter Lesson Series. Gift Certificates. The Alexander Technique and the Olympics. F. M. Alexander on film. Fall lesson series. Saving a Career in Music. Fall Intensives. Campaign for healthier ergonomic seating in schools. Arthritis Research UK. Special Spring Lesson Series. Spring Intensives. Harvard Health publishes introductory article on the Alexander Technique. Alleviating back pain. How to squat. Winter Intensives. The Alexander Technique "lie down." Annals of Internal Medicine publishes Alexander Technique study. New Year Intensives. Actor Jonathon Pryce. How the Alexander Technique can help with osteoperosis. Holiday Intensives. The Alexander Technique and Education. AT and Hypermobility Syndrome. Gift Certificates. Alexander Technique Center graduate. Master teachers Joan and Alex Murray visit. Text Neck. Fall Intensives. Fall lesson series.